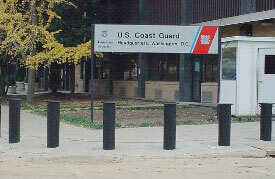 The project consisted of the installation of 200 fixed perimeter crash bollards at the US Coast Guard Headquarters Building located in Washington, D.C. Work included demolition and removal of existing concrete and sidewalks, erosion control, landscaping, extensive traffic control and security measures during construction. This project was completed in under 60 days. 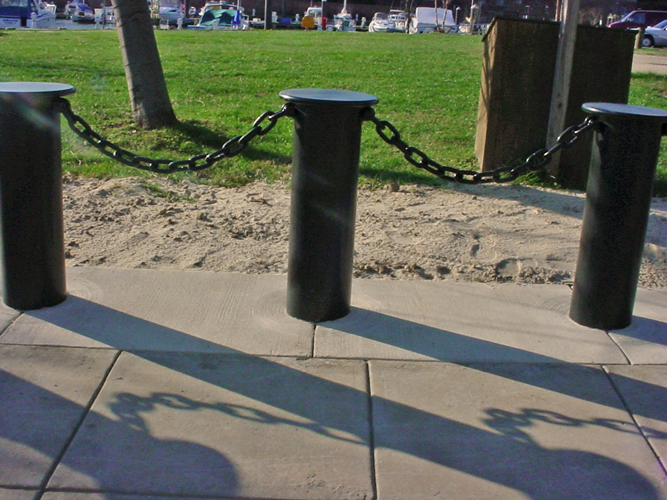 Furnished and installed two hydraulic bollard systems each consisting of 10 bollards. Each system is embedded in concrete that is 4' wide x 5' deep x 45' long. 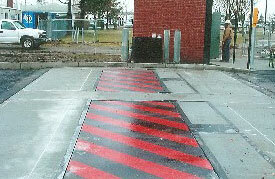 The systems are capable of activating half of a roadway at a time or the entire roadway. Both systems have standard operation mode and EFO mode. The systems are complete with traffic lights and safety loops placed in the roadway. The systems employ custom techniques to maintain operation in temperatures to 50 degrees below zero. ICS maintained the bollards for 3 years. The barrier wall project consisted of all excavation, foundations, masonry brick, and all associated landscaping. ICS has completed and is currently working on multiple sites at Andrew’s Air Force Base. 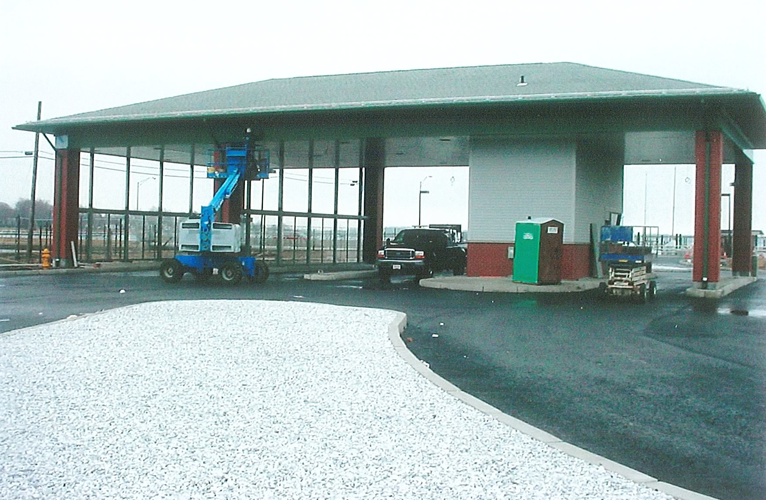 Phase 1 and Phase 2 consisted of installation of 15 each Entry and/or Exit Control Points using sliding gates. Five of these gates utilize a “no follow” drop arm at the inbound locations. Work included all preparatory work, site work, electrical and control installation, gate installation, and landscaping restoration. Other projects include installation of 7,000 feet of fiber optic/communications and electrical utilities with all associated concrete work and landscaping restoration. 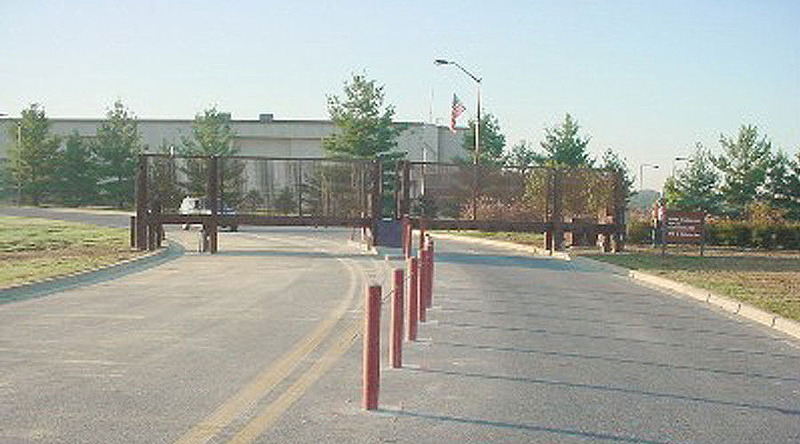 ICS provided and installed 2 hydraulic operated plate barriers in the entrance road to the US Naval Station located in Newport, Rhode Island. The project was a security upgrade - improvement to the facilities current status. 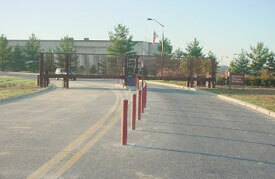 The K8 rated operable barriers were custom fabricated to a width of 13’ to match the entrance conditions. The barriers are complete with traffic lights, roadway sensors, master control panel, and 3 remotes control panels. This project was completed on time and on budget.